Burning coal, oil and gas produces greenhouse gases which cause climate change. This is perhaps the one thing that the UK Government, leaders of every major political party, every large UK business and trade union, every major religion and every scientific organization can agree on. And that’s not all. Climate change is not the only problem. The UK economy is dependent on fossil fuels – but we’re running out. North Sea oil and gas production has peaked. We are going to have to rely on imports for the first time in 30 years and some of this will come from some pretty unstable parts of the World. And it’s not going to get any cheaper. Whatever way you look at it we need to reduce our reliance on fossil fuels. This is why the Basingstoke Transition Network exists. It’s not a talking shop or social club, but a place where we can start making the transition from a fossil fuelled economy to a low carbon society. Burning oil, coal and gas in our power stations and in our cars produces pollution that gives us acid rain, asthma, cancer and climate change. We are also dramatically changing the chemistry of our seas and oceans. It is time to come together and make a change for the better. 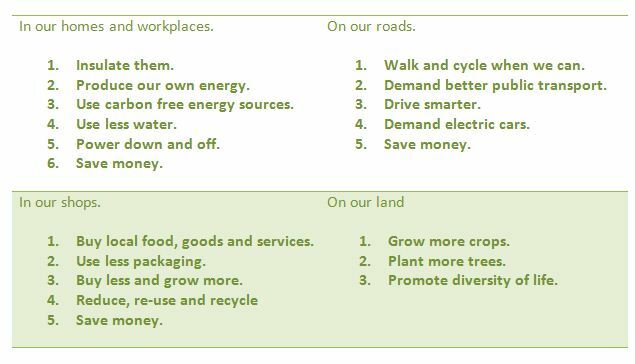 Ideally, we need to reduce our carbon footprint by 80%. It sounds a lot; and it is if we try to do it all at once. But just a 2% reduction a year will get us there. It has to start today. It has to reduce every year. It has to be everyone. And that’s why transition initiatives are about communities. Communities of local people, local businesses, local government and local organisations. Working together, we can make the impossible become reality. Make today the day you make a change for the better!